I loved my early a.m. coffee rainbow view. A funny and quite unexpected thing happened while I was teaching in Palm Springs. David's print dealer, Larry Warnock of Warnock Fine Arts came by and saw my prints. 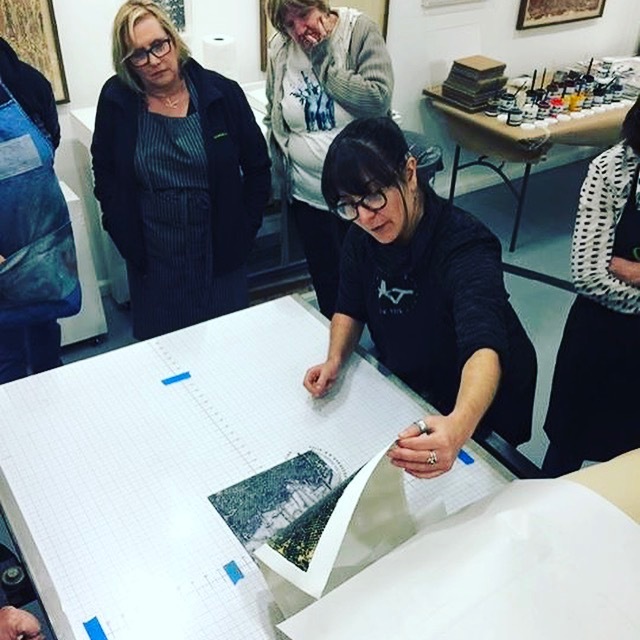 After a wonderful three-day Encaustic Collagraph workshop at David A. Clark's studio in Palm Springs, 2017 seems to be shaping up as the year for prints. I had a great group of new and returning students for my class. Many prints were pulled and we had our own "Women's Printmaking March" over inauguration weekend. My fabulous host, artist David A. Clark even got in on the act and I managed to make five new prints too! Larry immediately selected 11 of my prints to take to the Portland Fine Print Fair January 27-29 and the Los Angeles Fine Print Fair February 3-5. 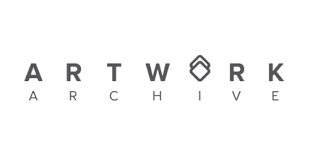 Big thanks to David for connecting me with this great opportunity to enter the print market as a fellow artist in the stable of Warnock Fine Arts. 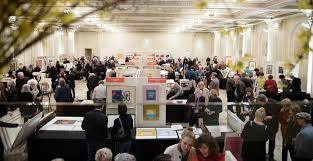 Unearthed, opened the same night as the Los Angeles Fine Print Fair on Friday, February 3. Here are some installation shots of this 19 piece exhibition which features a combination of prints and encaustic collagraph plates. Through February 26th at Atelier 6000 in Bend, OR. Featured in Cascade A&E , Bend Source and the Bend Bulletin. Printmaking has become an important part of my studio practice. What I enjoy most is its immediacy, sheer spontaneity and element of surprise. Not knowing exactly what will come from a print underlies my overall approach to painting, making way for new conceptual directions to evolve in my work. This way of working enables me to further refine my printmaking skills on my own terms as a painter. In putting together this body of work, the word “unearthed” kept coming up; this show embodies the diversity in my approaches toward integrating and marrying encaustic painting with printmaking. Some of the pieces are traditionally framed as prints under glass, others are mounted on board, glazed, color penciled or buried in wax. Still others, take a more 3D approach, showcasing the Plexiglas plates themselves framed in shadowboxes mimicking the print background in the form of an encaustic painting. Unearthed, represents a selection of collagraph prints which, through color, imagery and concept, have been informing my encaustic paintings. A conceptual conversation is continually taking place in my studio practice between both disciplines of printmaking and painting. The title of the show also signifies my method of process. With each painting exhibition, an edition of prints is unearthed, they are either framed, mounted or turned into paintings. All serve as studies for paintings, or vise-versa which creates a strong dialog that I have grown to thrive on as an artist. This particular body of prints spans five years and were created concurrently with my past five solo exhibitions in Portland, Boston and Seattle. My first solo exhibition Innovation & Integration at Gremillion & Co. Fine Art in Houston will be in May. 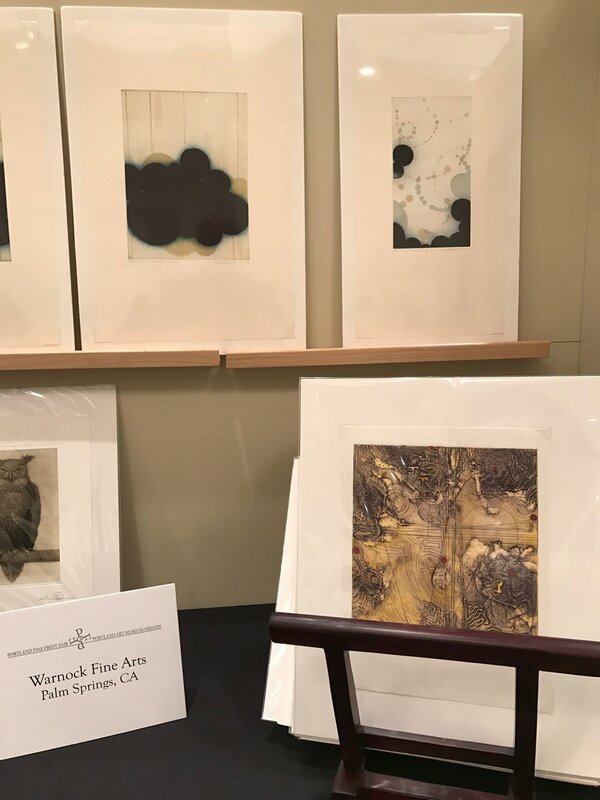 The gallery is participating in PrintHouston and will feature new work, prints, collagraph plates, and paintings that have derived from prints. The hanging system is portable and mounted on a cleat, enabling the verticle hangers to slide back and forth for scale variations. Meanwhile in the studio, I slowly chop away at my ongoing to do list. Most recently, we augmented my hanging system to accomodate my larger panels to my actual height (or, shortness) so that I don't have to get up on a step ladder to paint. The foundation of my studio interferes with keeping the paintings level on the wall while working and this was greatly interfering with my ability to work, and for a long time has limited the scale I have endeavored to be working. So, my talented woodworker, neighbor, assistant and all around collaborator, Brendan Alvistur made me a removable hanging system so that large paintings can hang flush to the wall below the foundation level. Brendan has also been the maker of my painting panels and storage crates over the past several years and helped me design the diptych panels with recessed wood separators for my Opposing Cartography and Pluto Atlas series. Next, Brendan is custom building a flat file cabinet for the base of my press table for paper and print storage. I could not be luckier to have him as my neighbor and friend! Thanks for signing up for my blog!